English Breakfast Tour Starts Tomorrow! 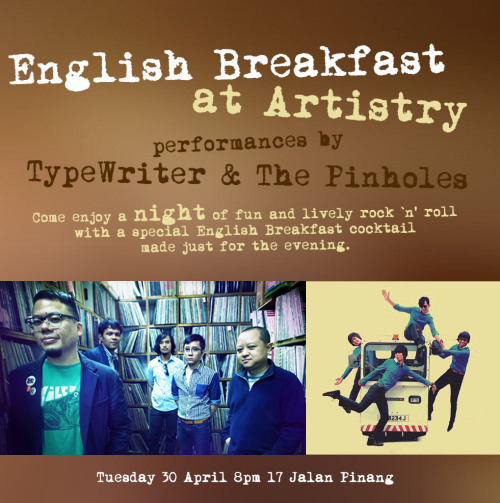 Our English Breakfast Tour begins tomorrow at gallery-cafe Artistry (located at 17 Jalan Pinang) with our friends The Pinholes. Artistry is creating an English Breakfast cocktail especially for the occasion and part of the proceeds from the sale of the drink will go to our tour fund. Merchandise by The Pinholes and TypeWriter will be on sale too. Gig starts at 8pm and is free entry.